The findings published in the journal eLife could help scientists learn more about "the functional mechanisms behind stem cell differentiation," said Wang, an associate professor of bioengineering. They may also guide researchers as they try to recreate these mechanisms in the lab, to coax stem cells into becoming tissues that could be used in transplants and other therapies. "The mechanical environment around a stem cell helps govern a stem cell's fate. Cells surrounded in stiff tissue such as the jaw, for example, have higher amounts of tension applied to them, and they can promote the production of harder tissues such as bone." Wang explained. Stem cells living in tissue environments with less stiffness and tension, on the other hand, may produce softer material such as fat tissue. Wang and his colleagues wanted to learn more about how these environmental forces are translated into the signals that stem cells use to differentiate into more specialized cells and tissues. In their experiment, they applied force to human mesenchymal stem cells -the type of stem cells found in bone marrow that transform into bone, cartilage and fat. When there were no calcium ions circulating outside the cell, this force helped to release calcium ions from a structure inside the cell called the endoplasmic reticulum. The release is aided by the cell's inner structural proteins called the cytoskeleton, along with contracting protein machinery called actomyosin. 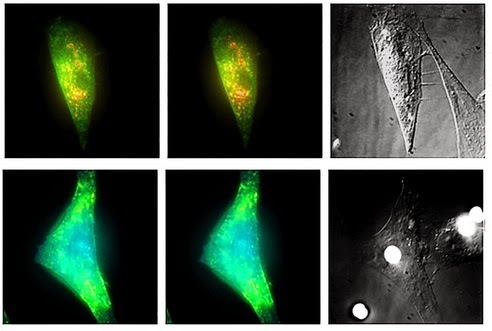 When the force triggered the movement of calcium ions into the cell from its extracellular environment, only the cytoskeleton was involved, the researchers noted. "They often trigger a molecular cascade inside cells, and can send signals to the cell nucleus that can turn on or off gene expression." said Wang. This type of signaling may be one link between the mechanical forces acting on a stem cell and its transformation into other cell types, said Wang. His team now plans to study the impact of mechanical force on other signaling pathways in a variety of cell types, to learn more about how they could regulate cell fate.